As the world becomes smaller, more and more plants get transported across oceans to thrive in new environments. Some of these plants thrive too well. With no natural pests or predators, they become invasive. 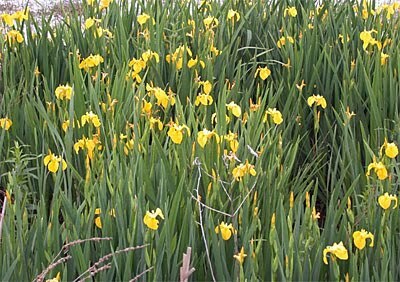 Yellow flag iris (Iris pseudacorus) is one of the species on the watch list in the northeast. As the world becomes smaller, more and more plants get transported across oceans to thrive in new environments. Some of these plants thrive too well. With no natural pests or predators, they become invasive. In an effort to slow the spread of invasive plants in our region, Gardener’s Supply will stop selling “invasives” at its stores in Vermont. Learn more in the article Slowing the Spread of Invasive Plants, which includes action steps for all gardeners. The Nature Conservancy is asking garden centers, nurseries, landscape designers and architects to sign a voluntary code of conduct pledging to stop selling, planting or designing with a list of “watched” species by March, 2011. The list includes plants that are not yet on the quarantine list, making them illegal to sell or purchase. Meanwhile, the conservancy will work to get these watched plants on the quarantine list. For many years, the conservancy has spread the word about invasive plants. In our region, the worst offenders are Japanese barberry, Norway maple, burning bush, yellow flag iris and amur maple. They have been on the watch list for many years, but pressure is mounting to move these plants to the quarantine list. For more information, see the conservancy’s list. Gardener’s Supply has supported this effort over the past several years in different ways. We’ve conducted workshops on invasive plants and our staff is well-trained on the subject. At our Burlington store, the watch list species have been off the shelves for the last five years. However, taking them out of the lineup at our Williston store is a recent development.